Many love everything about their birthday. They plan for it 6 months in advanced. They take off from work to sneak in a mini vacation. Some celebrate their entire birthday month! Well I’m somewhere in between. My birthday has never been a big deal but I love to spoil others for their birthday. I didn’t take off for my birthday but fortunately I only had a short day and was able to sleep in and relax before going in. My boyfriend was off and decided to cook breakfast for me. All I was expecting was eggs, a hash brown and a biscuit, something simple but yet filling. When he came upstairs and brought me my plate I was in aww of how much food was on the plate and also pretty impressed that it took such little time for him to prepare it. 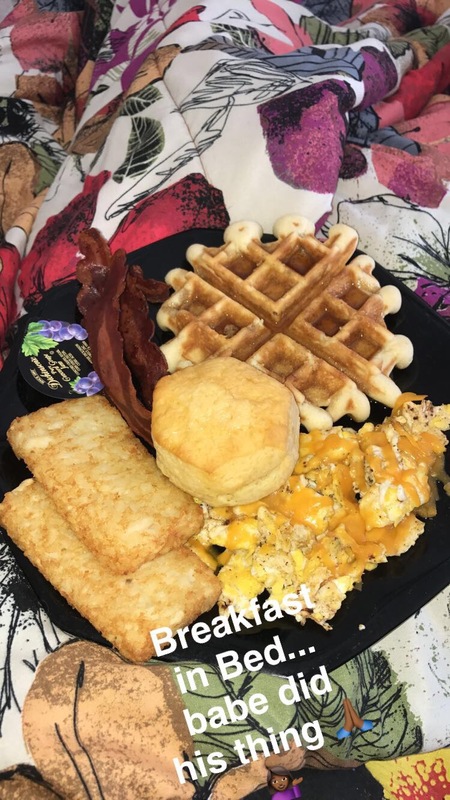 He made me waffles, a biscuit, eggs, hash browns, turkey bacon, and brought up two drinks for me to choose from as well. I was so excited and happy even though it was the simplest thing, it meant the world that he got up and made it for me to make me feel special. It’s the simple things that really count the most for me. We ate breakfast and then relaxed until I had to leave for work. It was the perfect start to the day, and the perfect weather was the icing on the cake if you will. Being grateful for the little things goes a long way and that breakfast went even further! What are some of your favorite things to eat for breakfast on your birthday? That sounds delicious! I’ll definitely have to try that out soon!